The Project X EvenFlow T1100 White is the final addition to the great EvenFlow line. Designed with the T1100 material from Toray, the shaft has the stiffest tip and stiffest mid-section of the line. This offers the lowest spin and lowest launch for stronger players. Available in 65, 75 and a new 85 gram weight. The balance point is slightly lower than the other shafts in the EvenFlow line which will lead to a slightly heavier feel and swing weight. These shafts also play stiff to flex in all weights so tipping is not necessary in your driver. So the 6.0 will play to a 7.0 and 6.5 to a 7.5 at standard 45 inch length and D2 swing weight in a Ping G400 LST driver for example. Even though the torque is a little higher than you would expect, this shaft will feel very stout with little to know “whip” at impact. 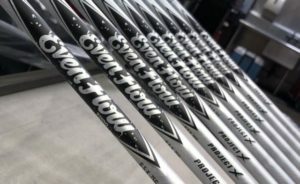 If you are a stronger player looking for the lowest launch and spin in your driver, or even for a fairway wood, the EvenFlow White should be your ticket.